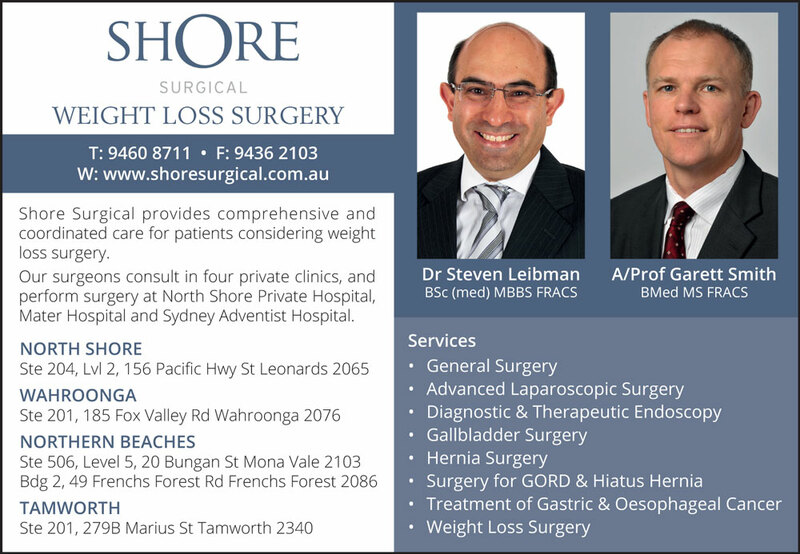 Shore Surgical provides comprehensive and coordinated care for patients considering laparoscopic (keyhole surgery) to achieve a durable weight loss. Patients cared for through our clinic benefit from our experienced and specialist team of surgeons, dietetic and psychological support. Our team provide thorough support and care throughout our patients weight loss surgery journey. We offer a number of laparoscopic weight loss procedures including revisional surgery for patients who have had previous procedures. Our surgeons consult in four private clinics, and perform surgery at North Shore Private Hospital, Mater Hospital and Sydney Adventist Hospital. Begin your journey to good health and wellbeing today. Contact us for more information on how we can help you create immediate change and live your best life through minimally invasive procedures.